This article is about the NASA rocket family. For the similarly-named US Air Force project of the 1960s, see Space Launching System. For Turkey's UFS satellite launcher, see Space Launch System (Turkey). Artist's rendering of the Space Launch System Block 1 sitting on Launch Pad 39B with the Orion spacecraft at sunrise. The SLS launch vehicle is to be upgraded over time with more powerful versions. Its initial Block 1 version is to lift a payload of 95 metric tons to low Earth orbit (LEO), which will be increased with the debut of Block 1B and the Exploration Upper Stage. Block 2 will replace the initial Shuttle-derived boosters with advanced boosters and is planned to have a LEO capability of more than 130 metric tons to meet the congressional requirement. These upgrades will allow the SLS to lift astronauts and hardware to destinations beyond LEO: on a circumlunar trajectory as part of Exploration Mission 1 & 2 with Block 1; to deliver elements of the Lunar Orbital Platform-Gateway (LOP-G) with Block 1B; and to Mars with Block 2. The SLS will launch the Orion Crew and Service Module and may support trips to the International Space Station if necessary. SLS will use the ground operations and launch facilities at NASA's Kennedy Space Center, Florida. On September 14, 2011, NASA announced its design selection for the new launch system, declaring that it, in combination with the Orion spacecraft, would take the agency's astronauts farther into space than ever before and provide the cornerstone for future US human space exploration efforts. During the early development of the SLS a number of configurations were considered, including a Block 0 variant with three main engines, a Block 1A variant that would have upgraded the vehicle's boosters instead of its second stage, and a Block 2 with five main engines and a different second stage, the Earth Departure Stage, with up to three J-2X engines. In February 2015, it was reported that NASA evaluations showed "over performance" versus the baseline payload for Block 1 and Block 1B configurations. Three versions of the SLS launch vehicle are planned: Block 1, Block 1B, and Block 2. Each will use the same core stage with four main engines, but Block 1B will feature a more powerful second stage called the Exploration Upper Stage (EUS), and Block 2 will combine the EUS with upgraded boosters. Block 1 has a baseline LEO payload capacity of 95 metric tons (105 short tons) and Block 1B has a baseline of 105 metric tons (116 short tons). The proposed Block 2 will have lift capacity of 130 metric tons (140 short tons), which is similar to that of the Saturn V. Some sources state this would make the SLS the most capable heavy lift vehicle built; although the Saturn V lifted approximately 140 metric tons (150 short tons) to LEO in the Apollo 17 mission. On July 31, 2013, the SLS passed the Preliminary Design Review (PDR). The review encompassed all aspects of the SLS's design, not only the rocket and boosters but also ground support and logistical arrangements. On August 7, 2014 the SLS Block 1 passed a milestone known as Key Decision Point C and entered full-scale development, with an estimated launch date of November 2018. In April 2017, NASA announced that the schedule for the maiden flight would slip to 2019. In November 2017, the EM-1 maiden flight slipped further to June 2020. The Space Launch System's Core Stage will be 8.4 meters (28 ft) in diameter and use four RS-25 engines. Initial flights will use modified RS-25D engines left over from the Space Shuttle program; later flights are expected to switch to a cheaper version of the engine not intended for reuse. The stage's structure will consist of a modified Space Shuttle external tank with the aft section adapted to accept the rocket's Main Propulsion System (MPS) and the top converted to host an interstage structure. It will be fabricated at the Michoud Assembly Facility. The core stage will be common across all currently planned evolutions of the SLS. Initial planning included studies of a smaller Block 0 configuration with three RS-25 engines, which was eliminated to avoid the need to substantially redesign the core stage for more powerful variants. Likewise, while early Block 2 plans included five RS-25 engines on the core, it was later baselined with four engines. Blocks 1 and 1B of the SLS will use two five-segment Solid Rocket Boosters (SRBs), which are based on the four-segment Space Shuttle Solid Rocket Boosters. Modifications for the SLS included the addition of a center booster segment, new avionics, and new insulation which eliminates the Shuttle SRB's asbestos and is 860 kg (1,900 lb) lighter. The five-segment SRBs provide approximately 25% more total impulse than the Shuttle SRB and will not be recovered after use. Orbital ATK (formerly Alliant Techsystems, part of Northrop Grumman since mid-2018) has completed full-duration static fire tests of five-segment SRBs. These include successful firings of three developmental motors (DM-1 to DM-3) from 2009 to 2011. The DM-2 motor was cooled to a core temperature of 40 °F (4 °C), and DM-3 was heated to above 90 °F (32 °C) to validate performance at extreme temperatures. Qualification Motor 1 (QM-1) was tested on March 10, 2015. Qualification Motor 2 was successfully tested on June 28, 2016. It was the final ground test before Exploration Mission 1 (EM-1). Aerojet, in partnership with Teledyne Brown, offered a booster powered by three AJ1E6 engines, which would be a newly developed LOX / RP-1 oxidizer-rich staged combustion engine. Each AJ1E6 engine would produce 4,900 kN (1,100,000 lbf) thrust using a single turbopump to supply dual combustion chambers. On February 14, 2013, NASA awarded Aerojet a $23.3 million, 30-month contract to build a 2,400 kN (550,000 lbf) main injector and thrust chamber. Alliant Techsystems (ATK) proposed an advanced SRB nicknamed "Dark Knight". This booster would switch from a steel case to one made of lighter composite material, use a more energetic propellant, and reduce the number of segments from five to four. It would deliver over 20,000 kN (4,500,000 lbf) maximum thrust and weigh 790,000 kg (1,750,000 lb) at ignition. According to ATK, the advanced booster would be 40% less expensive than the Shuttle-derived five-segment SRB. It is uncertain if the booster will allow SLS to deliver the mandated 130 t to LEO without the addition of a fifth engine to the core stage, as a 2013 analysis indicated a maximum capacity of 113 t with the baselined four-engine core. Pratt & Whitney Rocketdyne and Dynetics proposed a liquid-fueled booster named "Pyrios". Each booster would use two F-1B engines which together would deliver a maximum thrust of 16,000 kN (3,600,000 lbf) total, and be able to continuously throttle down to a minimum of 12,000 kN (2,600,000 lbf). The F-1B would be derived from the F-1 engine, which powered the first stage of the Saturn V. It would have been easier to assemble, with fewer parts and a simplified design, while providing improved efficiency and a thrust increase of 110 kN (25,000 lbf). Estimates in 2012 indicated that the Pyrios booster could increase Block 2 low-Earth orbit payload to 150 t, 20 t more than the baseline. Christopher Crumbly, manager of NASA's SLS advanced development office in January 2013 commented on the booster competition, "The F-1 has great advantages because it is a gas generator and has a very simple cycle. The oxygen-rich staged combustion cycle [Aerojet's engine] has great advantages because it has a higher specific impulse. The Russians have been flying ox[ygen]-rich for a long time. Either one can work. The solids [of ATK] can work." Later analysis showed the Block 1A configuration would result in high acceleration which would be unsuitable for Orion and could require a costly redesign of the Block 1 core. In 2014, NASA confirmed the development of Block 1B instead of Block 1A and called off the 2015 booster competition. In February 2015, it was reported that SLS is expected to fly with the five-segment SRB until at least the late 2020s, and modifications to Launch Pad 39B, its flame trench, and SLS's Mobile Launcher Platform were evaluated based on SLS launching with solid-fuel boosters. An RL10 engine, like the one pictured above, will be used as the second stage engine in both the ICPS and EUS upper stages. Block 1, scheduled to fly Exploration Mission 1 (EM-1) in 2020, will use the Interim Cryogenic Propulsion Stage (ICPS). This stage will be a modified Delta IV 5–meter Delta Cryogenic Second Stage (DCSS), and will be powered by a single RL10B-2. Block 1 will be capable of lifting 95 t in this configuration, however the ICPS will be considered part of the payload and be placed into an initial 1,800 km by -93 km suborbital trajectory to ensure safe disposal of the core stage. ICPS will perform an orbital insertion burn at apogee, and then a translunar injection burn to send the uncrewed Orion on a circumlunar excursion. In May 2018, NASA updated the payload capability of the SLS Block 1 from 70 to 95 metric tons to low Earth orbit. The Exploration Upper Stage (EUS) was scheduled to fly on Exploration Mission 2 (EM-2). It was expected to be used by Block 1B and Block 2 and, like the core stage, have a diameter of 8.4 meters. The EUS is to be powered by four RL10 engines, complete the SLS ascent phase and then re-ignite to send its payload to destinations beyond low-Earth orbit, similar to the role performed by the Saturn V's 3rd stage, the J-2 powered S-IVB. Because of delays in building the mobile launch platform needed to hold the more powerful EUS, the EM-2 flight might launch earlier than planned but it will not use the EUS, it will not carry a module for the Lunar Gateway and it will not orbit the Moon. Artist's impression of the Bimodal Nuclear Thermal Rocket engines on the Mars Transfer Vehicle (MTV). Cold launched, it would be assembled in-orbit by a number of Block 2 SLS payload lifts. The Orion spacecraft is docked on the left. The Earth Departure Stage, powered by J-2X engines, was to be the upper stage of the Block 2 SLS had NASA decided to develop Block 1A instead of Block 1B and the EUS. In 2013, NASA and Boeing analyzed the performance of several second stage options. The analysis was based on a second stage usable propellant load of 105 metric tons, except for the Block 1 and ICPS, which will carry 27.1 metric tons. The ICPS upper stage and upper stages using four RL10 engines and two MB60/RL60 engines and one J-2X engine were studied. In 2014, NASA also considered using the European Vinci instead of the RL10. The Vinci offers the same specific impulse but with 64% greater thrust, which would allow for a reduction of one or two of the four second stage engines for the same performance for a lower cost. Robotic exploration missions to Jupiter's water-ice moon Europa are increasingly seen as well suited to the lift capabilities of the Block 1B SLS. An additional beyond-LEO engine for interplanetary travel from Earth orbit to Mars orbit, and back, is being studied as of 2013 at Marshall Space Flight Center with a focus on nuclear thermal rocket (NTR) engines. In historical ground testing, NTRs proved to be at least twice as efficient as the most advanced chemical engines, which would allow quicker transfer time and increased cargo capacity. The shorter flight duration, estimated at 3–4 months with NTR engines, compared to 6–9 months using chemical engines, would reduce crew exposure to potentially harmful and difficult to shield cosmic rays. NTR engines, such as the Pewee of Project Rover, were selected in the Mars Design Reference Architecture (DRA). In 2017 NASA continued research and development on NTRs, designing for space applications with civilian approved materials, with a three-year, $18.8-million contract. Rendering of the SLS Block 1 with its older black-and-white paint scheme, showing core stage, two 5-segment SRBs, and the smaller upper stage. 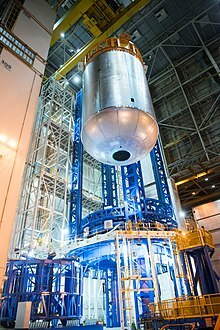 In mid-November 2014, construction of the first SLS rocket began using the new welding system in the South Vertical Assembly Building at NASA's Michoud Assembly Facility, where the Core Stage will be assembled. The SLS will have the ability to tolerate a minimum of 13 tanking cycles due to launch scrubs and other launch delays before launch. The assembled rocket is to be able to remain at the launch pad for a minimum of 180 days and can remain in stacked configuration for at least 200 days without destacking. In January 2015, NASA began test firing RS-25 engines in preparation for use on SLS. Tests continued throughout Spring of 2015. Further testing was conducted in 2016 and 2017. Multiple facilities throughout the country have started full scale fabrication of different segments of the launch vehicle. Orbital ATK began casting propellant for the solid rocket boosters and manufacturing parts for the boosters in 2016. The company test fired a solid rocket booster in early 2015, and a second booster in June 2016. During the joint Senate-NASA presentation in September 2011, it was stated that the SLS program had a projected development cost of $18 billion through 2017, with $10 billion for the SLS rocket, $6 billion for the Orion Multi-Purpose Crew Vehicle and $2 billion for upgrades to the launch pad and other facilities at Kennedy Space Center. These costs and schedule were considered optimistic in an independent 2011 cost assessment report by Booz Allen Hamilton for NASA. An unofficial 2011 NASA document estimated the cost of the program through 2025 to total at least $41bn for four 95 t launches (1 uncrewed, 3 crewed), with the 130 t version ready no earlier than 2030. The Human Exploration Framework Team (HEFT) estimated unit costs for Block 0 at $1.6bn and Block 1 at $1.86bn in 2010. However, since these estimates were made the Block 0 SLS vehicle was dropped in late 2011, and the design was not completed. The Space Review estimated the cost per launch at $5 billion, depending on the rate of launches. NASA announced in 2013 that the European Space Agency will build the Orion Service Module. NASA SLS deputy project manager Jody Singer at Marshall Space Flight Center, Huntsville, Alabama stated in September 2012 that $500 million per launch is a reasonable target cost for SLS, with a relatively minor dependence of costs on launch capability. By comparison, a Saturn V launch cost US$185 to US$189 million in 1969-1971 dollars or roughly $1.23 billion in 2016 dollars adjusted for inflation. On July 24, 2014, Government Accountability Office audit predicted that SLS would not launch by the end of 2017 as originally planned since NASA had not been receiving sufficient funding. In August 2014, as the SLS program passed its Key Decision Point C review and entered full development, costs from February 2014 until its planned launch in September 2018 were estimated at $7.021 billion. Ground systems modifications and construction would require an additional $1.8 billion over the same time period. As of February 2015[update] the Orion spacecraft was expected to enter its Key Decision Point C review in the first half of 2015. For Fiscal Year 2015, NASA received an appropriation of US$1.7 billion from Congress for SLS, an amount that was approximately US$320 million greater than the amount requested by the Obama administration. In October 2018, NASA's inspector general reported that the Boeing SLS stages contract portion (accounting "for over 40 percent of the $11.9 billion spent on the SLS Program" as of August 2018) is expected to cost a total of US$8.9 billion by 2021, which is twice the initial planned amount. For fiscal years 2011 through 2018, the SLS program had expended funding totaling $13,999 million in nominal dollars. This is equivalent to $15,109 million adjusting to 2018 dollars using the NASA New Start Inflation Indices. For 2019 to 2023, NASA "notional" yearly budgets for SLS range from $2.1 to $2.3B a year. As of late 2015, the SLS program has a 70% confidence level for its "first Orion mission with astronauts by 2023" according to the Associate Administrator for NASA, Robert Lightfoot. As of mid-2018, the SLS is scheduling its first test launch, with no crew, for mid-2020. There are no NASA estimates for the SLS program recurring yearly costs once operational, for a certain flight rate per year, or for the resulting average costs per flight. Bill Hill, NASA manager of exploration systems development has indicated "My top number for Orion, SLS, and the ground systems that support it is $2 billion or less" (annually). NASA associate administrator William H. Gerstenmaier has indicated, "[per mission] costs must be derived from the data and are not directly available. This was done by design to lower NASA's expenditures." The Space Access Society, Space Frontier Foundation and The Planetary Society called for cancellation of the project in 2011–12, arguing that SLS will consume the funds for other projects from the NASA budget and will not reduce launch costs. U.S. Representative Dana Rohrabacher and others added that instead, an orbital propellant depot should be developed and the Commercial Crew Development program accelerated. Two studies, one not publicly released from NASA and another from the Georgia Institute of Technology, show this option to be possibly cheaper. Others suggest it will cost less to use an existing lower payload capacity rocket (Atlas V, Delta IV, Falcon 9, or the derivative Falcon Heavy), with on-orbit assembly and propellant depots as needed, rather than develop a new launch vehicle for space exploration without competition for the whole design. The Augustine commission proposed an option for a commercial 75 metric ton launcher with lower operating costs, and noted that a 40 to 60 t launcher can support lunar exploration. However, doubts have also been expressed about the utility and cost of depots. Mars Society founder Robert Zubrin, who co-authored the Mars Direct concept, suggested that a heavy lift vehicle should be developed for $5 billion on fixed-price requests for proposal. Zubrin also disagrees with those that say the U.S. does not need a heavy-lift vehicle. SpaceX's CEO Elon Musk stated in 2010 that he would "personally guarantee" that his company could build a launch vehicle in the 140–150 t payload range, for $2.5 billion, or $300 million per launch, but cautioned that this price tag did not include a potential upper-stage upgrade. Musk went on to start development of the fully reusable BFR super-heavy launcher and upper stage Starship in the early 2010s. Because of this reusability, Musk claims that it will be the lowest cost super-heavy launcher ever made. If the price per launch and payload capabilities for the BFR are anywhere near Musk's claimed capabilities, the rocket will be substantially cheaper than the SLS. Rep. Tom McClintock and other groups argue that the Congressional mandates forcing NASA to use Space Shuttle components for SLS amounts to a de facto non-competitive, single source requirement assuring contracts to existing shuttle suppliers, and calling the Government Accountability Office (GAO) to investigate possible violations of the Competition in Contracting Act (CICA). Opponents of the heavy launch vehicle have critically used the name "Senate launch system". The Competitive Space Task Force, in September 2011, said that the new government launcher directly violates NASA's charter, the Space Act, and the 1998 Commercial Space Act requirements for NASA to pursue the "fullest possible engagement of commercial providers" and to "seek and encourage, to the maximum extent possible, the fullest commercial use of space". In 2013, Chris Kraft, the NASA mission control leader from the Apollo era, expressed his criticism of the system as well. Lori Garver, former NASA Deputy Administrator, has called for cancelling the program. Phil Plait has voiced his criticism of SLS in light of ongoing budget tradeoffs between Commercial Crew Development and SLS budget, also referring to earlier critique by Garver. The Planetary Society accepted that a Mars mission could be had with existing budgets. The list below includes only NASA planned missions published in April 2017, and updated in September 2018. Exploration Mission 1 EM-1 1 Crew N/A June 2020 Scheduled 25.5 days Distant retrograde lunar orbit Send Orion capsule on trip around the Moon, deploy 13 CubeSats. Exploration Mission 2 EM-2 1 Crew 4 people June 2022 Scheduled 9 days Lunar flyby First crewed Orion capsuleand Interim Cryogenic Propulsion Stage (ICPS) to be sent on a free-return trajectory around the moon. Exploration Mission 3 EM-3 1B Crew 4 people 2024 Planned 30 days L2 Southern Near Rectilinear Halo Orbit (NRHO) Deliver European System Providing Refuelling, Infrastructure and Telecommunications (ESPRIT), the U.S. Utilization Module to LOP-G.
Exploration Mission 2 EM-2 1B Crew 4 people Late 2022 Delegated to commercial launcher 16-26 days Lunar halo orbit Deliver Power and Propulsion Element (PPE) as the first module of the Lunar Orbital Platform-Gateway (LOP-G). Exploration Mission 6 EM-6 1B Crew 4 people 2024 Delegated to commercial launcher 26-42 days L2 Southern NRHO First logistics module supply mission and delivery of the robotic arm to LOP-G.
Ares V, a cargo vehicle design for the Constellation Program of the 2000s. ^ SLS has greater thrust than Saturn V but a lower payload capability. ^ "NASA commits to $7 billion mega rocket, 2018 debut". CBS News. August 27, 2014. Retrieved March 13, 2015. ^ a b Andy Paszior (September 7, 2011). "White House Experiences Sticker Shock Over NASA's Plans". The Wall Street Journal. Retrieved February 22, 2015. ^ a b "ESD Integration, Budget Availability Scenarios" (PDF). Space Policy Online. August 19, 2011. Retrieved September 15, 2011. ^ a b c d e f g h i Harbaugh, Jennifer (July 9, 2018). "The Great Escape: SLS Provides Power for Missions to the Moon". NASA. Retrieved September 4, 2018. ^ a b Creech, Stephen (April 2014). "NASA's Space Launch System: A Capability for Deep Space Exploration" (PDF). NASA. p. 2. Retrieved September 4, 2018. ^ a b c d e Clark, Stephen (November 20, 2017). "NASA expects first Space Launch System flight to slip into 2020". Spaceflight Now. Retrieved May 24, 2018. ^ a b c "space launch system" (PDF). NASAfacts. 2012. Archived from the original (PDF) on August 13, 2012. ^ Siceloff, Steven (April 12, 2015). "SLS Carries Deep Space Potential". Nasa.gov. Retrieved January 2, 2018. ^ "World's Most Powerful Deep Space Rocket Set To Launch In 2018". Iflscience.com. Retrieved January 2, 2018. ^ Chiles, James R. "Bigger Than Saturn, Bound for Deep Space". Airspacemag.com. Retrieved January 2, 2018. ^ "Finally, some details about how NASA actually plans to get to Mars". Arstechnica.com. Retrieved January 2, 2018. ^ a b c d e f g h i j k l m n o p Gebhardt, Chris (April 6, 2017). "NASA finally sets goals, missions for SLS – eyes multi-step plan to Mars". NASASpaceFlight.com. Retrieved August 21, 2017. ^ Harbaugh, Jennifer (May 12, 2017). "NASA Continues Testing, Manufacturing World's Most Powerful Rocket". Nasa.gov. ^ Wall, Mike (August 16, 2016). "Yes, NASA's New Megarocket Will Be More Powerful Than the Saturn V". Space.com. Retrieved September 13, 2018. ^ a b The Congress of the United States. Congressional Budget Office, October 2006, pp. X,1,4,9. "The Apollo Saturn V launch vehicle had a lift capability of 140 metric tons to low Earth orbit." ^ Wells, Jane (January 26, 2016). "Boeing builds the most powerful rocket ever made". cnbc.com. ^ Wood, Anthony (July 25, 2015). "Most powerful rocket ever edges closer to lift-off". New Atlas. Retrieved September 13, 2018. ^ "Space Launch System". aerospaceguide.net. ^ a b "The NASA Authorization Act of 2010". Featured Legislation. Washington DC, United States: United States Senate. July 15, 2010. Retrieved May 26, 2011. ^ "NASA Announces Key Decision For Next Deep Space Transportation System". NASA. May 24, 2011. Retrieved January 26, 2012. ^ "NASA Announces Design For New Deep Space Exploration System". NASA. September 14, 2011. Retrieved September 14, 2011. ^ "Press Conference on the Future of NASA Space Program". C-Span. September 14, 2011. Retrieved September 14, 2011. ^ Kenneth Chang (September 14, 2011). "NASA Unveils New Rocket Design". New York Times. Retrieved September 14, 2011. ^ a b c d Chris Bergin (October 4, 2011). "SLS trades lean towards opening with four RS-25s on the core stage". NASASpaceFlight.com. Retrieved January 26, 2012. ^ a b Bergin, Chris (February 23, 2012). "Acronyms to Ascent – SLS managers create development milestone roadmap". NASASpaceFlight.com. Retrieved April 9, 2012. ^ a b c d e Bergin, Chris. "Advanced Boosters progress towards a solid future for SLS". NasaSpaceFlight.com. Retrieved February 25, 2015. ^ a b "Space Launch System" (PDF). NASA Facts. NASA. October 11, 2017. FS-2017-09-92-MSFC. Retrieved September 4, 2018. ^ Karl Tate (September 16, 2011). "Space Launch System: NASA's Giant Rocket Explained". Space.com. Retrieved January 26, 2012. ^ a b Stephen Clark (March 31, 2011). "NASA to set exploration architecture this summer". Spaceflight Now. Retrieved May 26, 2011. ^ Dwayne Day (November 25, 2013). "Burning thunder". ^ Thomas P. Stafford (1991). "America at the Threshold - Report of the Synthesis Group on America's Space Exploration Initiative". p. 31. ^ "NASA's Space Launch System Program PDR: Answers to the Acronym". NASA. August 1, 2013. Retrieved August 3, 2013. ^ a b "NASA Completes Key Review of World's Most Powerful Rocket in Support". NASA. Retrieved October 26, 2015. ^ a b Foust, Jeff (August 27, 2014). "SLS Debut Likely To Slip to 2018". SpaceNews.com. Retrieved March 12, 2015. ^ Clark, Stephen (April 28, 2017). "NASA confirms first flight of Space Launch System will slip to 2019". Spaceflight Now. Retrieved April 29, 2017. ^ Sloss, Philip. "NASA ready to power up the RS-25 engines for SLS". NASASpaceFlight.com. Retrieved March 10, 2015. ^ a b Campbell, Lloyd (March 25, 2017). "NASA conducts 13th test of Space Launch System RS-25 engine". SpaceflightInsider.com. Retrieved April 29, 2017. ^ Chris Bergin (September 14, 2011). "SLS finally announced by NASA – Forward path taking shape". NASASpaceFlight.com. Retrieved January 26, 2012. ^ "NASA's Space Launch System Core Stage Passes Major Milestone, Ready to Start Construction". Space Travel. December 27, 2012. ^ Chris Bergin (April 25, 2011). "SLS planning focuses on dual phase approach opening with SD HLV". NASASpaceFlight.com. Retrieved January 26, 2012. ^ Bergin, Chris (June 16, 2011). "Managers SLS announcement after SD HLV victory". NASASpaceFlight.com. Retrieved January 26, 2012. ^ Priskos, Alex. "Five-segment Solid Rocket Motor Development Status" (PDF). ntrs.nasa.gov. NASA. Retrieved March 11, 2015. ^ "Space Launch System: How to launch NASA's new monster rocket". NASASpaceflight.com. February 20, 2012. Retrieved April 9, 2012. ^ "NASA and ATK Successfully Test Ares First Stage Motor". NASA. September 10, 2009. Retrieved January 30, 2012. ^ "NASA and ATK Successfully Test Five-Segment Solid Rocket Motor". NASA. August 31, 2010. Retrieved January 30, 2012. ^ "NASA Successfully Tests Five-Segment Solid Rocket Motor". NASA. August 31, 2010. Retrieved September 8, 2011. ^ Bergin, Chris (March 10, 2015). "QM-1 shakes Utah with two minutes of thunder". NASASpaceFlight.com. Retrieved March 10, 2015. ^ Keith Cowing (September 14, 2011). "NASA's New Space Launch System Announced – Destination TBD". SpaceRef. Retrieved January 26, 2012. ^ Frank Morring (June 17, 2011). "NASA Will Compete Space Launch System Boosters". Aviation Week. Retrieved June 20, 2011. ^ "NASA's Space Launch System: Partnering For Tomorrow" (PDF). NASA. Retrieved March 12, 2013. ^ Rachel Kraft (February 14, 2013). "NASA Awards Final Space Launch System Advanced Booster Contract". NASA. Retrieved February 19, 2013. ^ "The Dark Knights – ATK's Advanced Boosters for SLS revealed". NASASpaceFlight.com. January 14, 2013. ^ "Table 2. ATK Advanced Booster Satisfies NASA Exploration Lift Requirements". NASASpaceFlight.com. ^ Lee Hutchinson (April 15, 2013). "New F-1B rocket engine upgrades Apollo-era design with 1.8M lbs of thrust". Ars Technica. Retrieved April 15, 2013. ^ "Dynetics reporting "outstanding" progress on F-1B rocket engine". Ars Technica. August 13, 2013. Retrieved August 13, 2013. ^ "Dynetics PWR liquidize SLS booster competition". NASASpaceFlight.com. November 2012. ^ "SLS Block II drives hydrocarbon engine research". thespacereview.com. January 14, 2013. ^ "Wind Tunnel testing conducted on SLS configurations, including Block 1B". NASASpaceFlight.com. ^ "Second SLS Mission Might Not Carry Crew". spacenews.com. May 21, 2014. Retrieved July 25, 2014. ^ a b Rosenberg, Zach. "Delta second stage chosen as SLS interim". Flight International, May 8, 2012. ^ "Space Launch System Data Sheet". SpaceLaunchReport.com. Retrieved July 25, 2014. ^ "NASA confirms EUS for SLS Block 1B design and EM-2 flight". NASASpaceFlight.com. Retrieved July 24, 2014. ^ a b "SLS prepares for PDR – Evolution eyes Dual-Use Upper Stage". NASASpaceFlight.com. Retrieved March 12, 2015. ^ NASA may fly crew into deep space sooner, but there’s a price. Eric Berger. Ars Technica. 12 April 2018. Quote: "Without the Exploration Upper Stage, NASA will not be able to fly, in a single flight, crew members and pieces of a deep space gateway it hopes to build near the Moon in the 2020s." ^ Chris Bergin (November 9, 2011). "SLS J-2X Upper Stage engine enjoys successful 500 second test fire". NASASpaceFlight.com. ^ Chris Bergin (February 12, 2013). "Second J-2X engine prepares for SLS testing". NASASpaceFlight.com. ^ Chris Gebhardt (November 13, 2013). "SLS upper stage proposals reveal increasing payload-to-destination options". NASASpaceFlight.com. ^ David Todd (June 3, 2013). "SLS design may ditch J-2X upper stage engine for four RL-10 engines". Seradata. Archived from the original on March 4, 2016. ^ David Todd (November 7, 2014). "Next Steps for SLS: Europe's Vinci is a contender for Exploration Upper-Stage Engine". Seradata. Archived from the original on March 4, 2016. ^ Casey Dreier (July 21, 2014). "A generational opportunity for Europa". ^ "NASA Researchers Studying Advanced Nuclear Rocket Technologies". space-travel.com. ^ "How long would a trip to Mars take?". NASA. ^ "How Fast Could (Should) We Go to Mars? Comparing Nuclear Electric Propulsion (NEP) with the Nuclear Thermal Rocket (NTR) and Chemical Rocket for Sustainable 1-year human Mars round-trip mission". ^ a b Borowski, Stanley K.; McCurdy, David R.; Packard, Thomas W. (April 9, 2012). "Nuclear Thermal Propulsion (NTP): A Proven Growth Technology for Human NEO / Mars Exploration Missions" (PDF). NASA. ^ Borowski, Stanley K.; McCurdy, David R.; Packard, Thomas W. (August 16, 2012). "Nuclear Thermal Rocket/Vehicle Characteristics And Sensitivity Trades For NASA's Mars Design Reference Architecture (DRA) 5.0 Study" (PDF). NASA. ^ Chris Bergin (January 24, 2012). "SLS Exploration Roadmap evaluations provide clues for human Mars missions". NASASpaceFlight.com. Retrieved January 26, 2012. ^ Rick Smith for Marshall Space Flight Center, Huntsville AL (SPX) (January 10, 2013). "NASA Researchers Studying Advanced Nuclear Rocket Technologies". ^ "NASA Contracts with BWXT Nuclear Energy to Advance Nuclear Thermal Propulsion Technology. Aug 2017". ^ "SLS Engine Section Barrel Hot off the Vertical Weld Center at Michoud". NASA. ^ "SLS to be robust in the face of scrubs, launch delays and pad stays". NASASpaceFlight.com. April 4, 2012. Retrieved April 9, 2012. ^ Bergin, Chris (May 13, 2015). "QM-1 examinations boost as QM-2 prepares for casting". NASASpaceFlight.com. Retrieved June 28, 2016. ^ Sloss, Philip (June 27, 2016). "QM-2: Orbital ATK fires up SLS booster for final qualification test". NASASpaceFlight.com. Retrieved June 28, 2016. ^ "NASA facilities, teams ramp up SLS flight production for 2018 maiden flight". NASASpaceFlight.com. Retrieved January 26, 2016. ^ Marcia Smith (September 14, 2011). "New NASA Crew Transportation System to Cost $18 Billion Through 2017". Space Policy Online. Retrieved September 15, 2011. ^ Bill Nelson, Kay Bailey Hutchison, Charles F. Bolden (September 14, 2011). Future of NASA Space Program. Washington, D.C.: Cspan.org. ^ Booz Allen Hamilton (August 19, 2011). "Independent Cost Assessment of the Space Launch System, Multi-purpose Crew Vehicle and 21st Century Ground Systems Programs: Executive Summary of Final Report" (PDF). NASA. ^ Marcia Smith (September 9, 2011). "The NASA Numbers Behind That WSJ Article". Space Policy Online. Retrieved September 15, 2011. ^ "HEFT Phase I Closeout" (PDF). nasawatch.com. September 2010. p. 69. ^ Chris Bergin (October 4, 2011). "SLS trades lean towards opening with four RS-25s on the core stage". NASASpaceFlight.com. Retrieved September 16, 2013. ^ Lee Roop (July 29, 2013). "NASA defends Space Launch System against charge it 'is draining the lifeblood' of space program". AL.com. Retrieved February 18, 2015. ^ John Strickland (July 15, 2013). "Revisiting SLS/Orion launch costs". The Space Review. Retrieved February 18, 2015. ^ NASA Content Administrator, ed. (April 12, 2015) [January 16, 2013]. "NASA Signs Agreement for a European-Provided Orion Service Module". NASA. Archived from the original on January 18, 2013. ^ "NASA's huge new rocket may cost $500 million per launch". MSNBC. September 12, 2012. ^ "SP-4221 The Space Shuttle Decision- Chapter 6: ECONOMICS AND THE SHUTTLE". NASA. Retrieved January 15, 2011. ^ "Apollo Program Budget Appropriations". NASA. ^ Morrison, Lauren; Bale, Lauren (July 24, 2014). "Federal audit reveals not enough money for NASA to get SLS off the ground". 48 WAFF. ^ Davis, Jason. "NASA Budget Lists Timelines, Costs and Risks for First SLS Flight". The Planetary Society. Retrieved March 11, 2015. ^ "NASA'S MANAGEMENT OF THE SPACE LAUNCH SYSTEM STAGES CONTRACT" (PDF). NASA OIG. NASA Office of Inspector General Office of Audits. October 10, 2018. Retrieved October 14, 2018. ^ "NASA New Start Inflation Indices". National Aeronautics and Space Administration. Retrieved June 23, 2016. ^ "FY 2013 Presidents Budget Request Summary" (PDF). National Aeronautics and Space Administration. p. BUD-4. Retrieved June 23, 2016. ^ "NASA, Assessments of Major Projects" (PDF). General Accounting Office. March 2016. p. 63. Retrieved June 23, 2016. ^ "FY 2014 Presidents Budget Request Summary" (PDF). National Aeronautics and Space Administration. p. BUD-8. Retrieved June 23, 2016. ^ "FY 2015 Presidents Budget Request Summary" (PDF). National Aeronautics and Space Administration. p. BUD-5. Retrieved June 23, 2016. ^ a b "FY 2016 Presidents Budget Request Summary" (PDF). National Aeronautics and Space Administration. p. BUD-5. Retrieved June 23, 2016. ^ a b "FY 2018 Budget Estimates" (PDF). National Aeronautics and Space Administration. p. BUD-3. Retrieved December 16, 2018. ^ a b "H.R.244 - Consolidated Appropriations Act, 2017". congress.gov. 2017. Retrieved December 16, 2018. ^ a b "Consolidated Appropriations Act, 2018". govinfo.gov. Retrieved December 16, 2018. ^ a b "Fiscal Year 2010 Budget Estimates" (PDF). National Aeronautics and Space Administration. p. v. Retrieved June 23, 2016. ^ "FY 2008 Budget Estimates" (PDF). National Aeronautics and Space Administration. p. ESMD-14. Retrieved June 23, 2016. ^ "NASA's Ground Systems Development and Operations Program Completes Preliminary Design Review". National Aeronautics and Space Administration. Retrieved June 23, 2016. ^ "Definitive Contract NNM12AA82C". govtribe.com. Retrieved December 16, 2018. ^ "Consolidated Appropriations Act 2016" (PDF). house.gov. p. 183. Retrieved December 16, 2018. ^ "NASA FY 2019 Budget Estimates" (PDF). nasa.gov. p. BUD-2. Retrieved December 16, 2018. ^ Foust, Jeff (September 16, 2015). "First Crewed Orion Mission May Slip to 2023". SpaceNews.com. Retrieved June 23, 2016. ^ Clark, Stephen (September 16, 2015). "Orion spacecraft may not fly with astronauts until 2023". spaceflightnow.com. Retrieved June 23, 2016. ^ Clark, Smith (May 1, 2014). "Mikulski "Deeply Troubled" by NASA's Budget Request; SLS Won't Use 70 Percent JCL". spacepolicyonline.com. Retrieved June 23, 2016. ^ Foust, Jeff. "NASA adding more SLS Block 1 launches to manifest". spacenews.com. Retrieved December 16, 2018. ^ Berger, Eric (August 19, 2016). "How much will SLS and Orion cost to fly? Finally some answers". arstechnica.com. Retrieved December 16, 2018. ^ Berger, Eric (October 20, 2017). "NASA chooses not to tell Congress how much deep space missions cost". arstechnica.com. Retrieved December 16, 2018. ^ a b c Henry Vanderbilt (September 15, 2011). "Impossibly High NASA Development Costs Are Heart of the Matter". moonandback.com. Retrieved January 26, 2012. ^ a b Ferris Valyn (September 15, 2011). "Monster Rocket Will Eat America's Space Program". Space Frontier Foundation. Archived from the original on October 6, 2011. Retrieved September 16, 2011. ^ "Statement before the Committee on Science, Space, and Technology US House of Representatives Hearing: A Review of the NASA's Space Launch System" (PDF). The Planetary Society. July 12, 2011. Archived from the original (PDF) on March 29, 2012. Retrieved January 26, 2012. ^ Rohrabacher, Dana (September 14, 2011). "Nothing New or Innovative, Including It's Astronomical Price Tag". Archived from the original on September 24, 2011. Retrieved September 14, 2011. ^ "Rohrabacher calls for "emergency" funding for CCDev". parabolicarc.com. August 24, 2011. Retrieved September 15, 2011. ^ Jeff Foust (September 15, 2011). "A monster rocket, or just a monster?". The Space Review. ^ Jeff Foust (November 1, 2011). "Can NASA develop a heavy-lift rocket?". The Space Review. ^ Mohney, Doug (October 21, 2011). "Did NASA Hide In-space Fuel Depots To Get a Heavy Lift Rocket?". Satellite Spotlight. Retrieved November 10, 2011. ^ "Propellant Depot Requirements Study" (PDF). HAT Technical Interchange Meeting. July 21, 2011. ^ Cowing, Keith (October 12, 2011). "Internal NASA Studies Show Cheaper and Faster Alternatives to the Space Launch System". SpaceRef.com. Retrieved November 10, 2011. ^ "Near Term Space Exploration with Commercial Launch Vehicles Plus Propellant Depot" (PDF). Georgia Institute of Technology / National Institute of Aerospace. 2011. ^ "Affordable Exploration Architecture" (PDF). United Launch Alliance. 2009. Archived from the original (PDF) on October 21, 2012. ^ Grant Bonin (June 6, 2011). "Human spaceflight for less: the case for smaller launch vehicles, revisited". The Space Review. ^ Robert Zubrin (May 14, 2011). "How We Can Fly to Mars in This Decade—And on the Cheap". Mars Society. Archived from the original on March 19, 2012. ^ Rick Tumlinson (September 15, 2011). "The Senate Launch System – Destiny, Decision, and Disaster". Huffington Post. ^ Andrew Gasser (October 24, 2011). "Propellant depots: the fiscally responsible and feasible alternative to SLS". The Space Review. ^ Review of U.S. Human Space Flight Plans Committee; Augustine, Austin; Chyba, Kennel; Bejmuk, Crawley; Lyles, Chiao; Greason, Ride (October 2009). "Seeking A Human Spaceflight Program Worthy of A Great Nation" (PDF). NASA. Retrieved April 15, 2010. ^ "The Space Review: Doubts about depots". thespacereview.com. August 2009. ^ "NASA Considering In-Orbit Fuel Depots". spacesafetymagazine.com. November 6, 2011. ^ Alan Boyle (December 7, 2011). "Is the case for Mars facing a crisis?". MSNBC. Archived from the original on January 7, 2012. ^ John K. Strickland, Jr. "The SpaceX Falcon Heavy Booster: Why Is It Important?". National Space Society. Retrieved January 4, 2012. ^ "NASA Studies Scaled-Up Falcon, Merlin". Aviation Week. December 2, 2010. Archived from the original on July 27, 2012. ^ "Spacex BFR to be lower cost than Falcon 1 at $7 million per launch". nextbigfuture.com. Retrieved January 17, 2019. ^ "Congressman, Space Frontier Foundation, And Tea Party In Space Call For NASA SLS Investigation". moonandback.com. October 4, 2011. Retrieved October 20, 2011. ^ "The Senate Launch System". Competitive Space. October 4, 2011. Retrieved October 20, 2011. ^ "NASA veteran Chris Kraft upfront with criticism". August 2013. ^ "Garver: NASA Should Cancel SLS and Mars 2020 Rover". Space News. January 2014. ^ "Why NASA Still Can't Put Humans in Space: Congress Is Starving It of Needed Funds". 2015. ^ "The Space Review: Doing humans to Mars on—and within—a budget". thespacereview.com. April 2015. ^ a b c d e f Sloss, Philip (September 11, 2018). "NASA updates Lunar Gateway plans". NASASpaceFlight.com. Retrieved September 17, 2018. ^ a b Hambleton, Kathryn. "Exploration Mission-1 Map". nasa.gov. NASA. Retrieved September 16, 2018. ^ "Acronyms to Ascent – SLS managers create development milestone roadmap". Retrieved October 26, 2015. ^ a b c d e f g Gebhardt, Chris (September 22, 2017). "SLS EM-1 & -2 launch dates realign; EM-3 gains notional mission outline". NASASpaceFlight.com. Retrieved September 23, 2017. ^ a b Hambleton, Kathryn. "NASA's First Flight With Crew Important Step on Long-term Return to the Moon, Missions to Mars". nasa.gov. NASA. Retrieved September 16, 2018. ^ Daines, Gary (December 1, 2016). "First Flight With Crew Will Mark Important Step on Journey to Mars". Nasa.gov. Retrieved January 2, 2018. ^ a b Foust, Jeff (March 10, 2017). "NASA moving ahead with plans for cislunar human outpost". SpaceNews. Pocket Ventures, LLC. Archived from the original on March 11, 2017. Retrieved March 11, 2017. ^ Sloss, Philip (December 4, 2017). "NASA evaluates EM-2 launch options for Lunar Orbital Platform - Gateway PPE". NASASpaceFlight.com. Retrieved December 8, 2017. ^ "Additional $1.3 billion for NASA to fund next Mars rover, Europa mission -". thespacereporter.com. Archived from the original on January 18, 2016. ^ "A Lander for NASA's Europa Mission". planetary.org. ^ Foust, Jeff (March 25, 2015). "NASA Selects Boulder Option for Asteroid Redirect Mission". Space News. Retrieved March 27, 2015. ^ Wall, Mike (April 10, 2013). "Inside NASA's Plan to Catch an Asteroid (Bruce Willis Not Required)". Space.com. TechMediaNetwork. Retrieved April 10, 2013. ^ Warner, Cheryl (October 23, 2018). "NASA Seeks Information for Gateway Cargo Delivery Services". nasa.gov. NASA. Retrieved October 27, 2018. Wikimedia Commons has media related to Space Launch System. "Preliminary Report on Multi-Purpose Crew Vehicle and Space Launch System" (PDF), NASA.